King Artaxerxes gives the Jews their liberty. EARS PASSED BY, and another change came in the Persian rule. A new king, name Artaxerxes, sat on the throne in Shushan and governed the people in many lands. 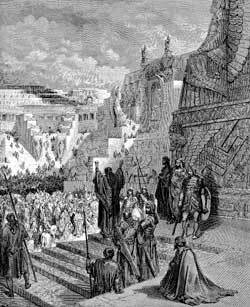 His kingdom included the land of Judah, where Zerubbabel had gone long before with a company of Jews to rebuild the temple of the Lord. Now Artaxerxes, wished to know how things were going in Judah, and he planned to send a messenger to Jerusalem to learn about the people and their needs. The messenger whom he chose to send was Ezra, the priest. Ezra was an earnest-hearted Jew, as Daniel had been. He was also called a scribe, because he wrote the words of God in books. And he longed to teach the Jews everywhere about the law of God, which had been given by Moses to the Israelites. At the King's command he assembled other Jews from Babylon and from the country places and cities near by who wished to go to Judah and help strengthen the courage of the poor Jews who lived there. Ezra had talked much to the King about the true God, and about his great power and his willingness to care for those who love and serve him. And the King was interested. He believed that the God of the Jews must be a very powerful God indeed. He feared to displease such a great God, so he commanded that much gold and silver be given to Ezra and his companions to carry back to Jerusalem and use in the temple of the Lord. When Ezra and his companions were ready to start on their long journey, they first spent some time fasting and praying God to bless them and protect them from the many dangers along their way. For the road over which they must travel led through dangerous places and wild people of the desert often stopped travelers and robbed them of their possessions. Ezra knew this, and he had no soldiers of the king to go with him and protect him and his companions from the attack of robber bands. He was ashamed to ask the King for soldiers because he had told the King that God would care for those who served him. So he and his companions prayed earnestly that God would bring them through the dangers without letting any harm befall them. Then they started down the long, long road. After about four months of travel, this company of Jews reached Judah in safety. They had lost nothing by the way, for God had heard their prayers and had cared for them. And they came with joy to the city where the temple of the Lord stood, just as Zerubbabel had built it. After resting for three days they brought their gifts of silver and gold, which the King had sent, and gave them to the priests who had charge of the temple. Ezra soon found out that things had not been going well in Judah. The poor Jews had become much discouraged, and some of them had made friends with their heathen neighbors. They had even allowed their sons and their daughters to marry heathen people, and they were not teaching their children to keep the law as God gave it to Moses. They had never rebuilt the city of Jerusalem, and the walls lay in ruins just as Nebuchadnezzar and his army had left them long years before. When Ezra learned about the condition of the poor Jews, he was deeply troubled. He knew they had sinned again by marrying heathen women, and he saw that God could never bless them while they were not obeying his law. So he prayed earnestly that God would forgive their sins, and he called them to Jerusalem to warn them about the wrong that they had done. The people were glad to have Ezra teach them what to do. They needed a teacher from God, like this good man, and they listened to his words. For a long time they had been without God's law, and now, when they heard his words, they quit their wrong-doing. Ezra stayed with the people for some time and taught them the words of God. He read to them from the great rolls that he had written, and they never grew tired of listening. They had no copies of God's law in their homes, for books were very few in those days and only rich people could afford them. Ezra had collected the books that Moses and Samuel and David had written, and the books of the prophets. These were the books from which he read to the Jews.